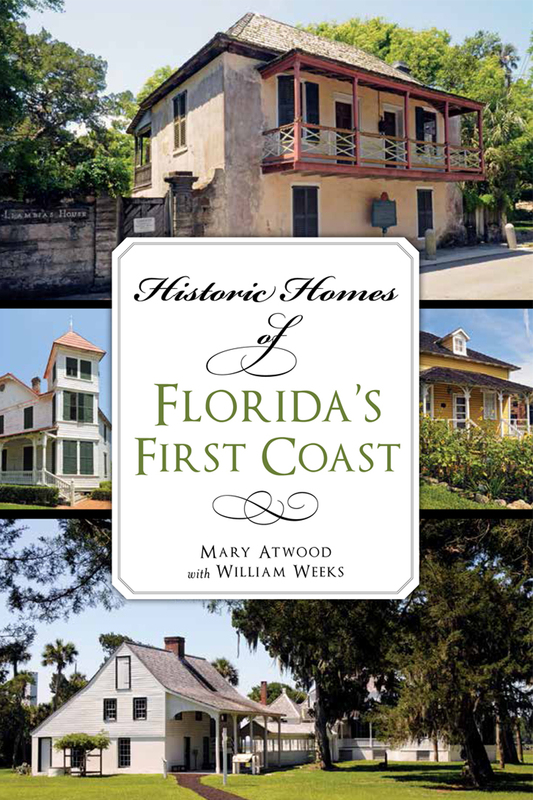 Mary Atwood’s new book, Historic Homes of Florida’s First Coast, provides readers with the opportunity to tour more than twenty historic North Florida structures which span a time period of more than 250 years. Among the homes featured are Spanish Colonial structures in St. Augustine, the Kingsley Plantation house, and simple “Cracker” style houses. Collectively, these homes and their stories span a time of more than 250 years. Residents of these homes included European royalty, writer Marjorie Kinnan Rawlings, composer Frederick Delius and a number of lesser known but equally important early settlers of the North Florida area. The book also includes more than 90 images, including 30 vintage photographs and 60 original photographs created by Ms. Atwood–many from the First Coast Reflections collection, as well as images created exclusively for the book. “Historic Homes of Florida’s First Coast” was written with the editorial assistance of Jacksonville writer, William Weeks and includes a foreword by renowned local historian Dr. Wayne Wood, and was published by The History Press. Personalized autographed copies may be purchased directly from Ms. Atwood. The book is also available from Amazon, Barnes and Noble, Books-A-Million and The History Press, as well as independent bookstores in the North Florida area.